In the last few months I have been posting a large amount of outfit looks worn by me on a daily basics and so far this is the most colourful outfit I have ever worn. It's just the whole colour palette of this look makes me happy and my style is more on the casual. Even though this outfit extremely casual I feel like a little princess. Normally people say that big long ball gown makes you feel like a princess but even though it's true for so weird reason as soon as I wore this outfit combo I felt happy. Not sure if it's the colours or just the floral prints on the shirt. I also, have a large amount of skirts in my closet but for some reason this skirt just felt perfect. After wearing this skirt I realized that when I wear skirts I always felt shorter however this time the pleated effect on the skirt gave me a taller illusion. I think I will be investing more on some pleated skirts in the future but for know I will stick with this particular one. Also, another new addiction I have been having are on sleeveless skirts, but now may you know that I have a insecurity issues with leaving my shoulders barely but in this top I didn't even noticed that. Overall, I love the whole outfit and I will be wearing combination more often. Well, that's all for know and what do you think of this look? Does it suit me and how would you pair your skirts? Your look is amazing!!! love the combination of color!! Amazing skirt!! Yellow is so pretty on you! Precioso sitio, con tu permiso me quedo para seguirte. Your beauty is certainly in full blossom with this outfit. I Hyped this on LOOKBOOK and totally dig your style. Your looks define "beautiful" here. I love the skirt the most. In addition, the sleeveless floral blouse and studded sandals are both as charming as your sweet smile and lovely hair. Truly amazing looks by you here, Harija. I like this maxi skirt, esp.the color! Hi sweety, you look stunning, love this cheery yellow skirt and your floral blouse is beautiful!Thanks for lending me your fashion insight, wishing you a great start to the new week! That skirt is summery perfection!! I absolutely LOVE the yellow!! Beautiful skirt! Love the color so much! You look so gorgeous! Hope you are having a wonderful day! Pretty skirt, and I love the floral print on your top! its a perfect outfit. love the colors. you look gorgeous harija! probably my most favorite outfit that you've ever worn.. the bright yellow looks amazing on you! Love the skirt great look! If you want to return to visit us and decide to follow our blog we reciprocate! The top and the skirt look lovely! Great colour combination. Loving the floral top Harija, looking adorable as always. Soo nice skirt. HAve a great day. Wow, that is the most beautiful skirt I've ever seen!! Thanks so much for stopping by my blog. Would you like to follow each other? 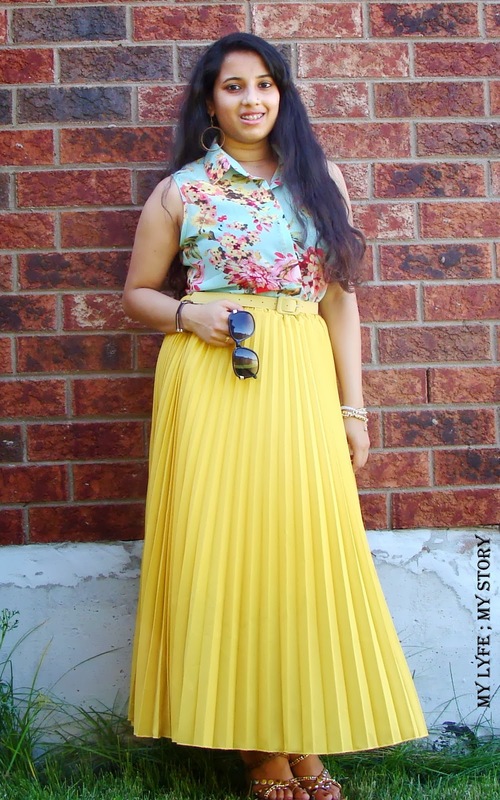 Lovely blog and lovely outfit! Love your bright maxi and your pretty top! Thanks for stopping by my blog! I love that your outfit is so bright and cheery! i love the summer look. wow those vibrant colors look so great on you! love that skirt and the shirt together! So love this look! So beautiful, so inspiring! Great ouftit! This is a great look! I love the colors you use to put together this outfit!